There are many creative ways to use wood that has been reclaimed or destined for the trash. You might not know that a typical pallet can be used to make many DIY projects at home. This includes building your own pallet strawberry planters. Making individual planters make a great option if you live in any areas that may not have space for a garden, or if you simply want to add raised planters to your existing garden. 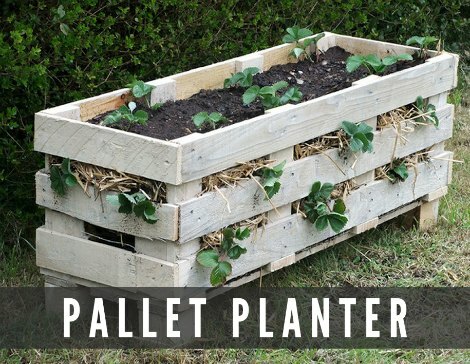 The number of pallet strawberry planters you can make will depend on the pallets that you have to use for the project. One pallet is needed to make a single planter. The slats of the pallet means your planter will have gaps. This will not be a problem as you can fill the gaps in your pallet strawberry planters by using plants or coming up with another solution. You will first need to obtain one or more pallets before you make any pallet strawberry planters to use in your yard. There are many places where pallets can be obtained. The best option is to seek out a store that has old pallets that have been thrown in the trash. Just make sure you obtain pallets that have not been chemically treated. The first thing to do when starting any pallet strawberry planters project is to dismantle the pallet. This will require the use of a hammer and various other tools. The need to dismantle the pallet will be crucial for the completion of the project. This video shows how to dismantle a pallet in less than 7 minutes. You have the option to place your pallet strawberry planters anywhere around your home. They can be a great addition along the edge of a patio or along the front of your porch. The options for the types of uses will depend on any need or preference.